Understanding the economic returns on investing in rural infrastructure improvements is a critical element in the decision-making process for public and private investors. 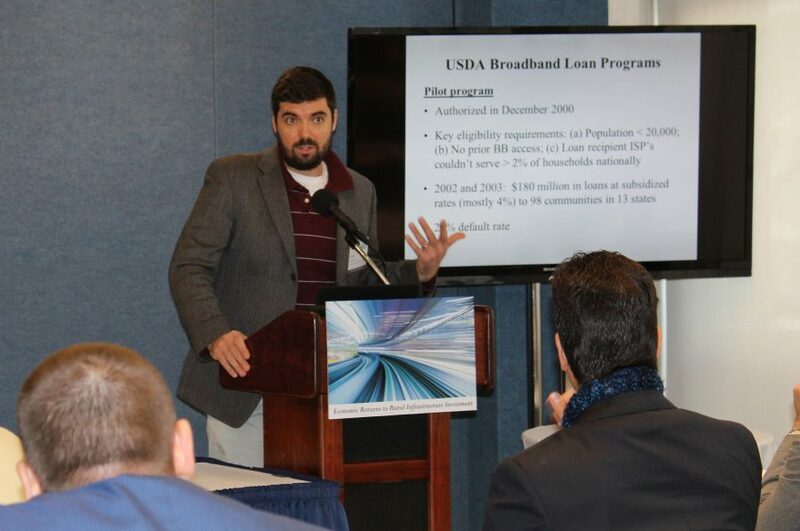 On April 10-11, 2018, Farm Foundation and USDA’s Economic Research Service brought together applied researchers and rural infrastructure stakeholders to examine the impact of rural infrastructure investments on economic activity and policy-related research findings. “This workshop highlighted the work that has been done, encouraged additional work by researchers, and identified areas where knowledge is needed,” notes John Pender, Chief of the Rural Economy Branch of ERS. Six papers were commissioned for the workshop. A seventh paper, authored by Anthony Homan, was previously published but was included in the workshop because of its high relevance to the topic. The findings and opinions expressed in the papers are those of the authors and do not represent those of Farm Foundation or ERS. Farm Foundation gratefully acknowledges BNSF Railway for its support of the commissioned papers. The papers are available below, along with a summary of the findings. Authors: John Pender of USDA’s Economic Research Service, and Max Torero of the World Bank. Ivan Kandilov of North Carolina State University discusses findings of the work he completed with Mitch Renkow, also of North Carolina State, at the Farm Foundation/ERS workshop, Economic Returns to Rural Infrastructure Investments. The workshop was an opportunity to review the best available evidence and chart a path towards producing practical research on the economic returns of investments in rural infrastructure, including highways, bridges, railways, broadband, electrical systems, and water and sewer systems. Workshop participants, including the authors of the seven commissioned papers, examined what is known about ROI on infrastructure improvements, identified gaps in the knowledge base, and assessed how this information can be used in future investment decision making by public- and private-sector leaders. Workshop participants included university researchers, government agency representatives, private consultants, community leaders, and experts in the economic assessment process used by international development organizations for project funding. The workshop was at the National Press Club, Washington, D.C.